Step one: buy plane tickets to and from the island. Step two: pack a towel and some TP. Step three: laze about on the beach in between flights. That was the extent of our plan. We followed Plan B for our entire trip. "There's the thing you plan to do, and then there's the thing you end up doing," This American Life. We planned to spend time on the beach. That being the depth of our expectation made it easy to relax and enjoy whatever we encountered... even though we encountered a lot of rain in the beginning. I've traveled with some challenging people in the past, so it was fun to have an adventure with someone who is spontaneous, willing to try new things, change plans and overall be flexible with every aspect of their surroundings. We arrived Monday afternoon in San Juan and it was beautiful, warm, sunny and the smell of the ocean filled the air. 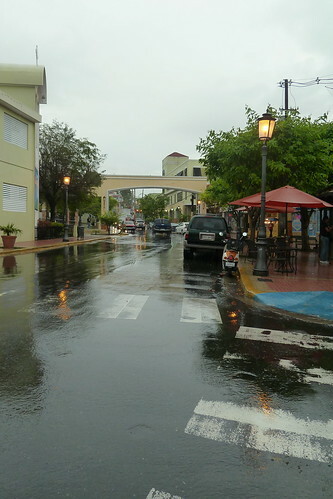 By the time we found a ride and made our way to Rincón, several hours had passed, we were on a different part of the island and it was raining. Let me digress for a moment to say there's nothing like being dropped off in the dark in front of a closed hostel, in the rain, and feeling uncertain if this is correct place. Luckily Stacey called a few days ahead because it only took ten minutes of pre-panicked investigating to discover a set of keys for us in the mailbox with a note to check in sometime the next day before 7pm. Whew. So it's Monday night and it's raining. Whatever. We walk to the nearest grocery store and pick up a few bottles of wine, sausage, cheese and crackers, then hang out in our hostel and make friends with the only other guest. Guest not present during the snapping of this photo. Tuesday morning is sunny, but turns to rain by noon. We can't control the weather so we swam and played in the ocean in the rain for hours. It kept raining more and more, so we bought umbrellas and walked the mile or so into town. 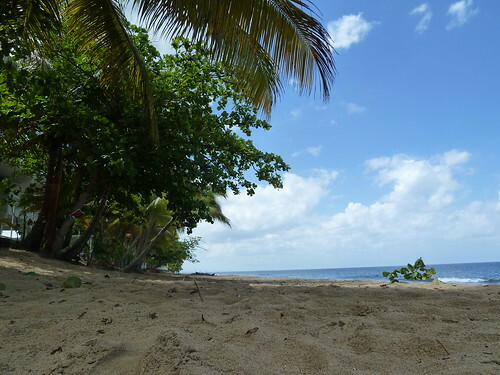 We seemed to be the only nonresidents in Rincón, world renown for its beaches yet freaking nobody was in Rincón because A: it was supposed to rain all week, B: Easter was the week before and C: Cinco de Mayo was the week after. Horrible timing on our part. Whatever. We mulled over the despairing news, explored a few abandoned houses, ate good food, made friends, enjoyed our evening in the rain. Wednesday morning we made our way to the nearest beach, swam, laid in the sand and enjoyed the sun - until it started to get cloudy. We were both annoyed. 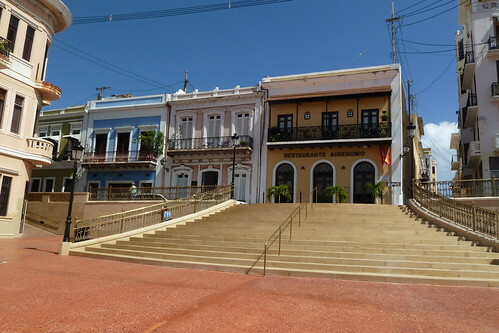 After a very short conversation we decided to get a car and head to Cabo Rojo for the rest of the day and then off to Old San Juan for our last night and day. I had to stop and think about why we picked those two places; we heard good things about Cabo Rojo from that dude we met Monday night and Old San Juan was closer to the airport so we wouldn't have to spend all of our last day traveling back to San Juan. Those were the deciding factors. According to my MacBook's translator, El Extremo is Spanish for THE END, however, the verbiage feels a little extreme to me.